The 21 wood-turned vessels in the Skylight Gallery are on view courtesy of the Firestone family, avid collectors of work by the Moulthrop family and many other wood-turning artists around the country. These bowls represent the work of three generations of Moulthrop artists, Ed (1916-2003), Philip (born 1947) and Matt (born 1977), each working with wood native to the Southeast. 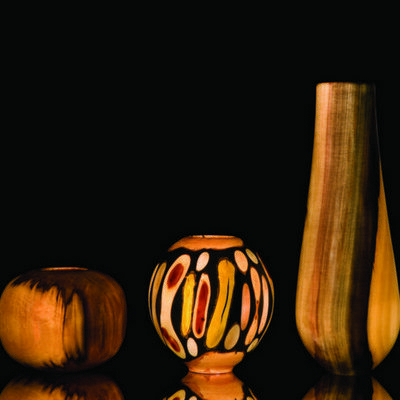 All are lathe-turned using uniquely developed tools and techniques and such woods as Ashleaf Maple, Hackberry, and Streaked Georgia Pine.